This Month’s Book: Should I Share My Ice Cream? 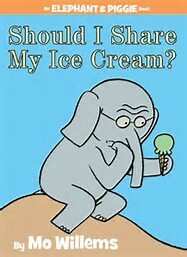 Our Cover to Cover Book of the Month for July is Should I Share My Ice Cream? by Mo Willems. This wonderful Piggie and Gerald book explores the process of sharing and what a dilemma it can be. Do you think Gerald will share his ice cream? Read the book and find out!! Print awareness, a child’s ability to understand that written words have meaning, is an important early literacy skill. We can foster this awareness by pointing out the environmental print we see every day, and underlining the words we read in books. Mo Willems uses speech bubbles throughout the book to draw attention to Gerald and Piggie’s words! While reading, point out the words inside the speech bubbles. Talk with your child about which character is saying the words. Role playing is a wonderful form of play that allows a child to literally put themselves in someone else’s shoes. When children have the chance to experience what it feels like to be someone else, they begin to practice empathy. Empathy is critical to social and emotional development. Invite your child to pretend, role-play, and recreate stories with items from around the house. Kids love dressing up in Mommy or Daddy’s clothes! Be creative! We can’t wait to see what you loved about Should I Share My Ice Cream?